One hot trend this past fall was combining the edginess of leather with the feminine feel of lace. I wanted to replicate that on my Christmas packages this year using things I already had around the house. 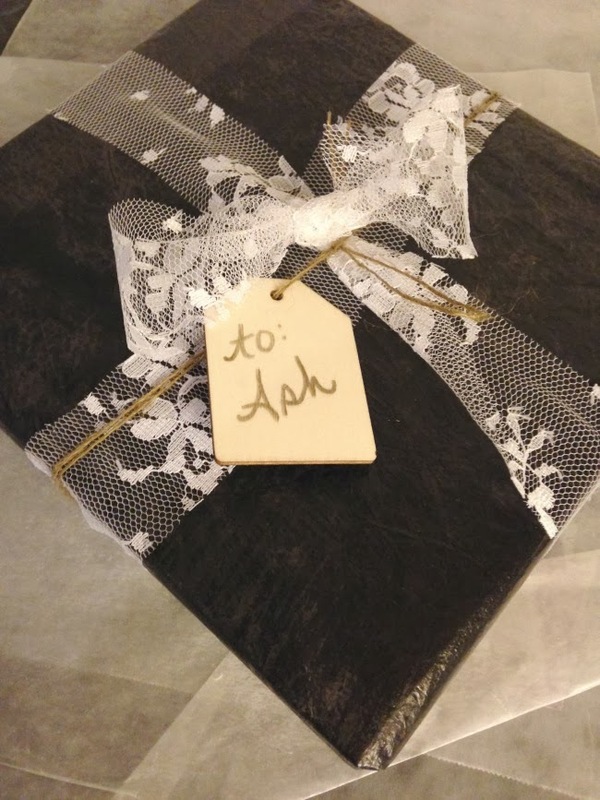 Obviously I don't think you should wrap your gifts with real leather or even faux leather, but it was fun to try to make plain-ol tissue paper look like leather. cost: I had all these items in my craft box but I can't imagine that it would cost any more than a roll of wrapping paper. b // Wad your tissue paper up tight. Then carefully flatten it back out. c // Place it on top of a piece of freezer paper, which should be shiny side up. d // With your iron on high, run it over the tissue paper. Be careful not to go over an exposed edges of freezer paper. The iron will bond the two pieces together but leave a few nice wrinkles that looks like leather. f // Trim down the lace into a long strip and tie it on the gift however you like. I used wood gift tags with metallic paint pens. If you have a wood burner, give it a try on the gift tag for an extra special look. I going to try to find one on a Black Friday sale today. What's your gift wrap style?